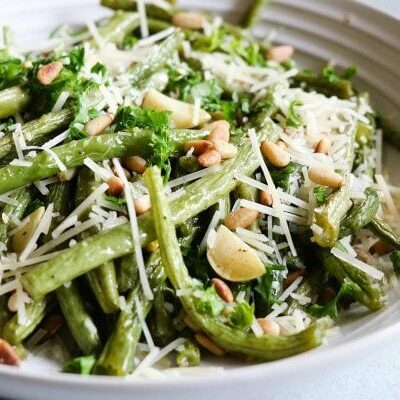 These Creamy Baked Green Beans are a repeat recipe in my house! 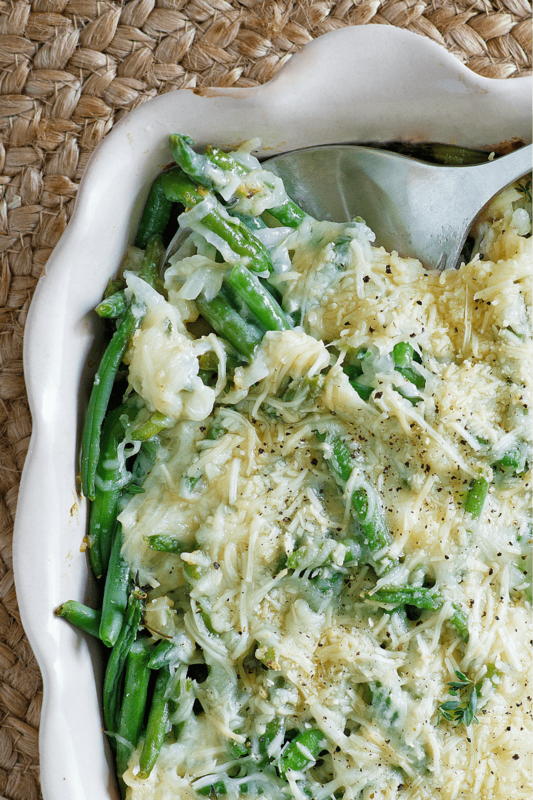 You’re probably familiar with the green bean casserole classic, right? You know… the one with the cream of mushroom soup and the crispy onions on top? 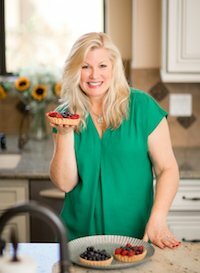 Everyone loves that recipe, and I do make my own version of it quite often for holiday dinners. 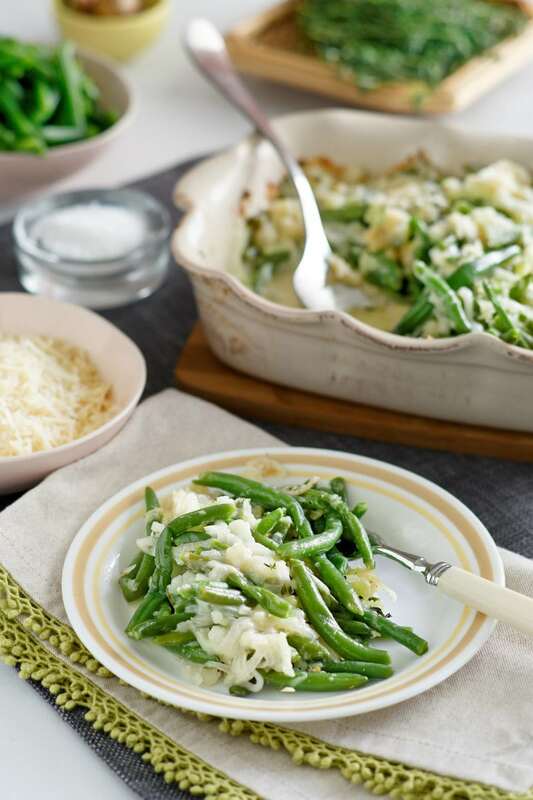 This Creamy Baked Green Beans recipe I’m sharing with you here is a different kind of green bean casserole. 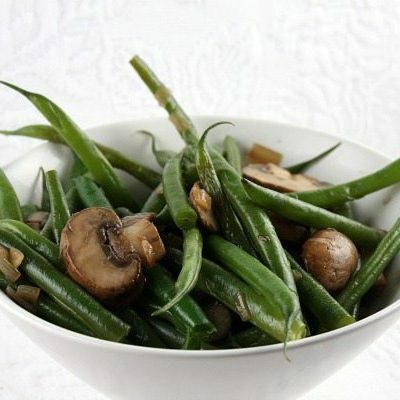 It calls for fresh green beans, and there is no cream of mushroom soup to be found. Onion and garlic are sauteed together before adding the green beans. Then some broth is added to the pan, and all is simmered together for a few minutes until the broth nearly evaporates. 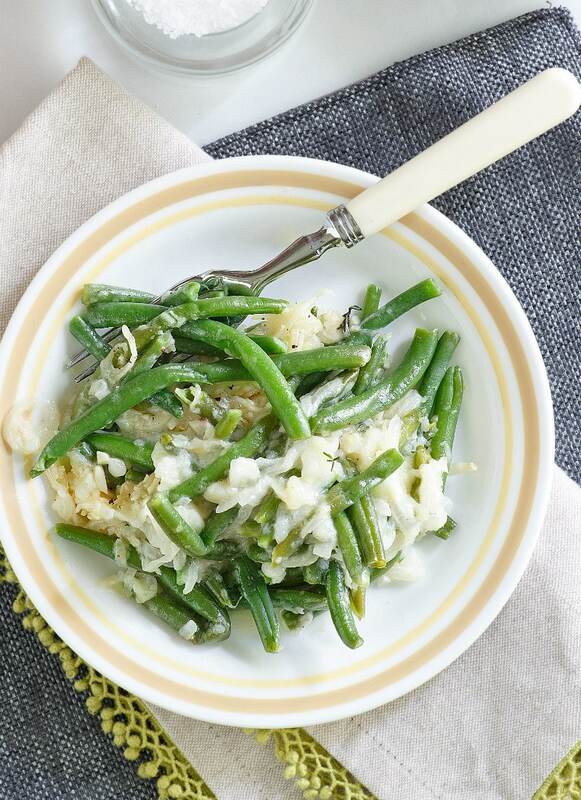 The creamy part of these Creamy Baked Green Beans comes in with added whipping cream. 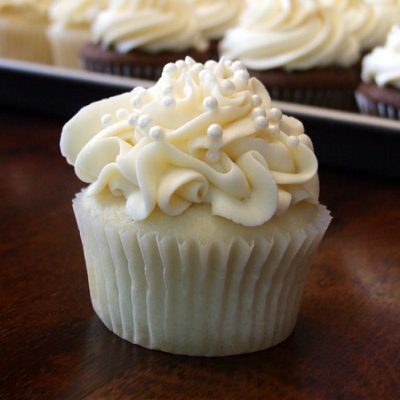 A touch of nutmeg is added for flavor. One more ingredient- shredded Parmesan- is mixed in, and then it’s spooned into a casserole dish with more Parmesan sprinkled on top. 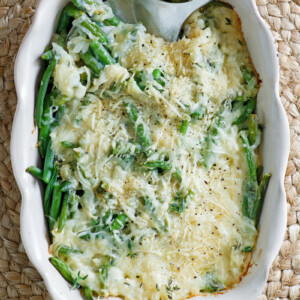 These Creamy Baked Green Beans are then baked for 15 to 20 minutes, just until the beans are tender-crisp. Spoon out individual servings, and you’ll get a little bit of the onion, creamy sauce and cheese with each spoonful. 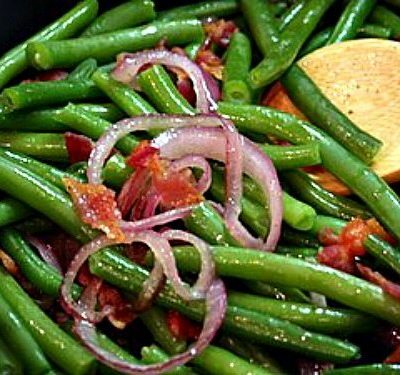 These green beans would obviously be a very nice addition to a Thanksgiving, Christmas or Easter dinner. I mention those major holidays since that’s when you usually make a green bean casserole. 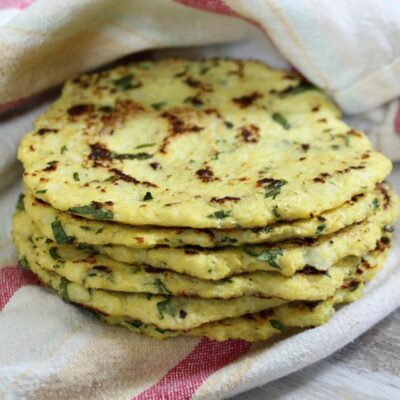 They’d also be delicious as a side dish for a dinner party. 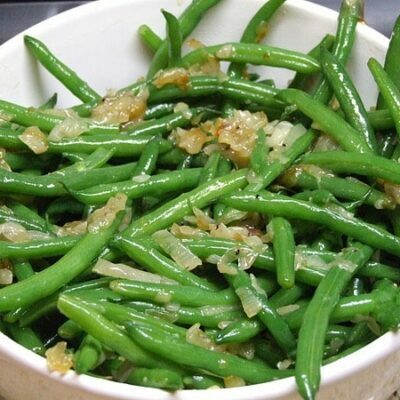 I love that they’re different than ho-hum steamed green beans- but not as rich as the classic green bean casserole. 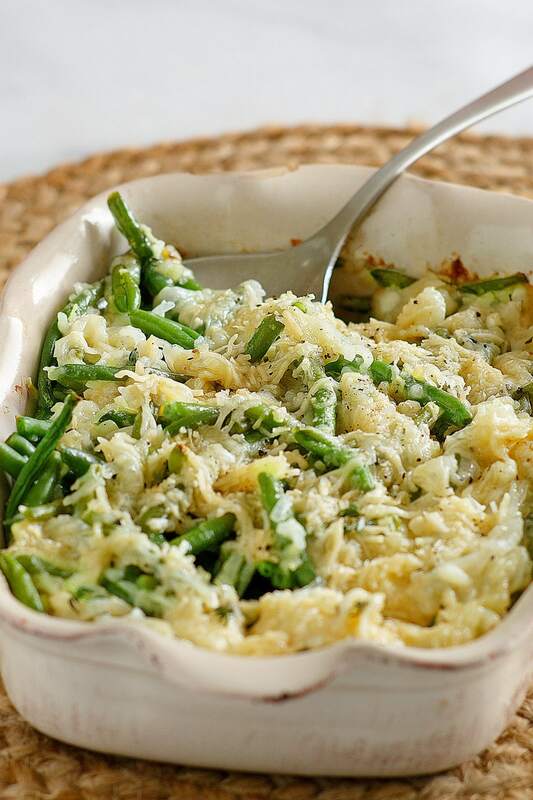 If you’re looking for more baked side dish recipes, you might like to try my Fresh Green Bean Casserole with Caramelized Onion Breadcrumbs or this Cauliflower Pizza Casserole. 5-Ingredient Corn Casserole, Streuseled Sweet Potato Casserole and Sour Cream and Onion Smashed Potato Casserole are good, baked side dish casseroles too. Preheat the oven to 350°F. Lightly coat a 1 1/2- quart oval baking dish with nonstick spray. In a 12- inch skillet, cook the onion and garlic in butter over medium heat for 3 minutes or until softened. Stir in the green beans and thyme. Cook for 4 minutes or until the onions begin to brown. Add the broth. Bring to boiling. Cook, stirring occasionally, for 3 to 4 minutes or until the broth is nearly evaporated. Add the whipping cream and nutmeg. Cook for 4 minutes or until the mixture begins to thicken. Transfer to the prepared baking dish. Stir in half of the cheese, all of the salt & pepper, and then sprinkle with the remaining cheese. Bake, uncovered, 15 to 20 minutes or until the beans are tender- crisp. If preparing this recipe as gluten-free, just be sure to use a brand of chicken broth that is known to be GF. You may also sub trimmed and halved brussels sprouts for the beans. Increase the baking time to 20 to 25 minutes. This recipe was originally shared in 2006. It was edited and re-published in 2018. This version is so unique and I love it! I’m looking forward to preparing it soon for my family! Well, I’d say you could prep earlier in the day, cover and refrigerate and then bake. I’m not sure about the night before though. 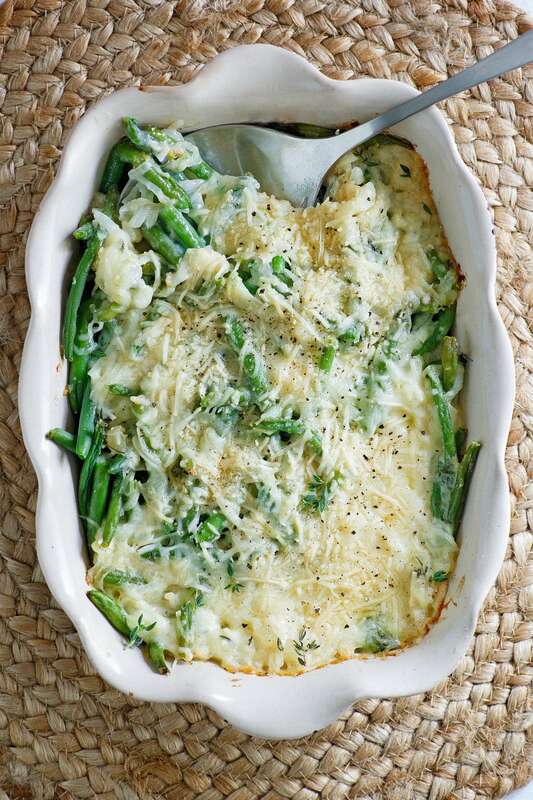 How many servings does this creamy baked green beans serve? 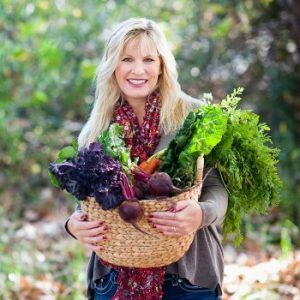 I’m looking for a recipe for thanksgiving that would accommodate my mom who is allergic to mushrooms and my brother in law who is gluten free and this looks like it would work. However we will have 20 people at our thanksgiving meal. I’d say it would serve about 8, considering all of the other dishes served at a Thanksgiving meal.